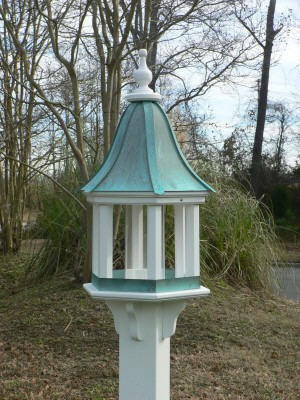 Patina Copper Roof Gazebo Bird Feeder is constructed to last a lifetime. This gazebo bird feeder is guaranteed not to crack, rot,split or fade. Add this beautiful bird feeder to your landscape as a focal point for everyone to see. Complete with vinyl sleeve and attached decorative brackets - fits on a 4 x 4 post. NOTE:Post NOT included but the sleeve to mount the 4X4 post IS included. The sleeve is 4 inch sleeve that mounts on a 4 X 4 post. Post can be purchased locally at most home improvement stores. OPTIONAL Vinyl square 4X4X72 vinyl post cover available upon request for $60.00.